This past week marked the one-year anniversary of ‘African Music Treasures’. Thanks to all of you who have responded, over the past year, for your contributions, suggestions, and encouragement. Over the last twelve months I have tried to feature genres, artists, and recordings from throughout Africa that don’t get much attention in the music press, on blogs, or by record companies. As I have spent more time going through the reels, vinyl, and cassettes in our archive I have stumbled (literally) on lots of wonderful recordings I had not heard; 45s from Algeria, the Central African Republic, and Mauritius, reels of Burundian Taarab groups from the 1980s, Tunisian Maalouf from the 1960s, or radio recordings from the Comoros, cassettes from Togo, Madagascar, Djibouti, and Chad. With so much interesting music I want to feature, I remain frustrated by the time it takes me to put together new posts and I thank you all for your patience!! To mark our first birthday I thought I’d feature some of the more ‘famous’ recordings in our collection. 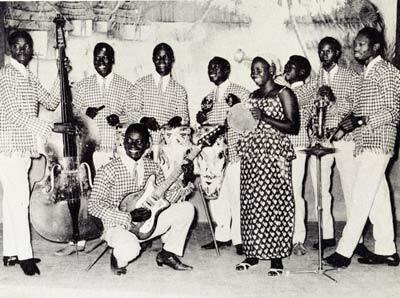 In 1959, the year after Guinea won its independence from France, Leo arrived in the capital city of Conakry, with his wife Mary and a Jeep full of recording equipment. He had spent the previous year in Ghana, recording regional musics for the Tempo International record company, and his boss ‘Colonel’ Irving Fogel wanted Leo to document the ‘new music from the new country of Guinea’. Over the course of his three years in Guinea, Leo traveled, with his partner El Hadj Sidiki Diabate (one of the most famous Griots of the modern era), and recorded groups-traditional and modern- in every region of Guinea. Over a series of ten lps, Tempo International released the cream of Leo’s Guinean recordings (see here for a discography of Tempo’s Guinean releases). Leo started to work for Tempo International records in Hollywood, California back in the late 1940s, soon after ‘Colonel’ Irving Fogel founded the company. Fogel got his nickname, and I suspect many of his business contacts, during his years of military service. In the spring of 1942, Fogel, who was already involved in the Los Angeles music business, was hired to help get the newly created Armed Forces Radio off the ground. During his years of military service, Fogel was part of a team that came up with creative solutions to the technical challenges of broadcasting programs throughout the world (these were the pre-satellite days). In 1944, as part of the allied invasion of Italy, Fogel also helped rebuild the Radio Audizioni Italania, which subsequently became Italy’s public radio and television network. After the war, Fogel returned to Los Angeles and launched several businesses that drew on of his army experiences. His varied endeavors included music publishing, producing film soundtracks (he would buy the rights to musical scores, then send a conductor to Austria or Yugoslavia to record, taking advantage of cheaper orchestras), installing the first ‘entertainment systems’ in US submarines (these were twelve track tape machines, with each track featuring a particular genre of music), and Tempo International records. The bulk of Tempo’s catalog consisted of movie soundtracks and light pop music (think Lawrence Welk in Hollywood). The most interesting lps on the Tempo label are the lps of Afghani, Ghanaian and Guinean music that Leo produced. As far as I can tell, Fogel’s goal was to amass a collection of field recordings from throughout the world that he could sell to Hollywood studios for use in films. Soon after Fogel hired Leo in the late 1940s, Leo and his wife Mary drove to Hollywood and moved into ‘Colonel’ Fogel’s castle in the hills outside of town. Over the next two years Leo trained as a recording engineer, cutting his teeth as an assistant on sessions with different symphonic orchestras. From Hollywood Leo was sent to Washington D.C. to work with Tempo’s sister company US Recording, which built customized reel machines, generators, and battery units for field recording. In 1953, Leo was sent to Pakistan, where, working with the music director of Radio Pakistan he spent six months recording music throughout the country. At the end of the year, Leo and Mary drove their jeep across the Khyber Pass and settled in Kabul, Afghanistan, where they would spend the next four years, before moving to Ghana, in 1958. None of the Tempo International releases of Guinean music were commercially released. When Leo would return to Conakry from his various recording trips, he would go through his raw recordings, select the most interesting takes, and then edit the lp masters. These master tapes, along with his unedited field recordings, pictures, and liner notes, were then sent to Tempo International in Hollywood, where all of the ten Guinean lps were pressed in limited editions of 2,500. Tempo sent the bulk of each pressing to the Guinean government, and none of these lps were commercially released. Unfortunately, most of the master tapes from Leo’s Guinean years were lost in a fire that destroyed most of the Tempo International archives. We have in our collection only a handful of Leo’s Guinean field tapes. All of the tracks below are taken from the lps. The first five Tempo lps (numbers 7008-7012) featured some of Guinea’s most appreciated Griots interpreting masterpieces of the classic Mandingo repertoire. 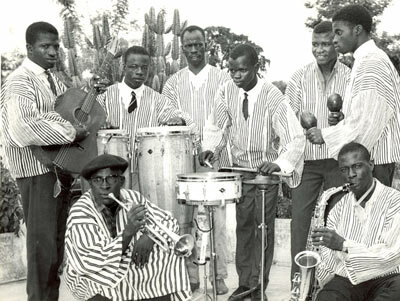 The next four lps (numbers 7013-7016) were the first recordings released of modern Guinean dance bands; a musical style that the Syliphone record label, fanatical collectors, and recent CD reissues have anchored in the mainstream of popular African music history, alongside Fela’s Afrobeat, Congolese Rumba, Senegalese Mbalax, and South African Mbaqanga. Historically, perhaps the most interesting of these lps is Tempo 7015, which was released in 1962 and features the first recordings of Bembeya Jazz (the label mistakenly uses the name ‘Orchestre de Beyla’. The Bembeya Jazz was the regional orchestra from the town of Beyla in southern Guinea). 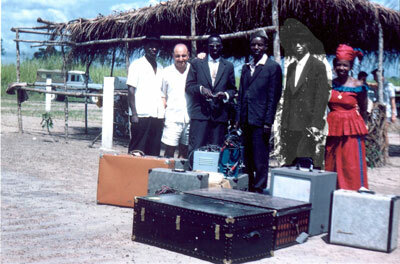 The Bembeya Jazz was formed in March of 1961, and Leo showed up in Beyla several months later. 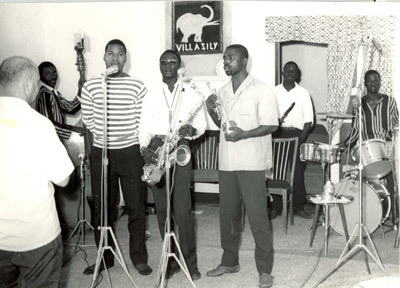 For a detailed history of Bembeya Jazz, and a good account of Leo’s time in Guinea check out this Afropop feature from a few years back. Here is what Bembeya sounded like six years before their first Syliphone release, and before they plugged in! Leo recorded the group when they were still a little ragged and working on their sound. These recordings are, I think, particularly interesting because they caught the group at a time when they probably weren’t ready yet to record. I can’t think of any other recordings of a seminal modern African group that were made so soon after the formation of the group. My favorite track on the lp is ‘Seneiro’ which features a nice guitar solo by Sekou Diabate, who at the time was the youngest member of Bembeya Jazz. This next track, ‘Din Ye Kassila’ is listed on the label as a ‘Cha-Cha-Mambo’ and features the female singer Jenne Camara. ‘Lele’ is a percussion rave-up that is described as a ‘Rhythme Africain’. Musically speaking, I think the most interesting of the Tempo records is Tempo 7013 which features the Orchestre de Danse de Gueckedou. Of the four ‘modern’ groups Leo recorded they were the most together. Tempo released two lps by the Orchestre de Danse de Gueckedou that featured their repertoire of Boleros, Cha-Chas, Calypsos, and Beguines. 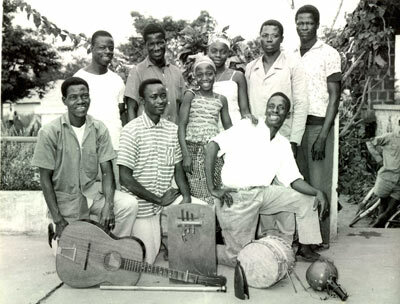 The fourth lp of modern Guinean music (Tempo 7016) featured two groups from the southern town of Kissidougou. 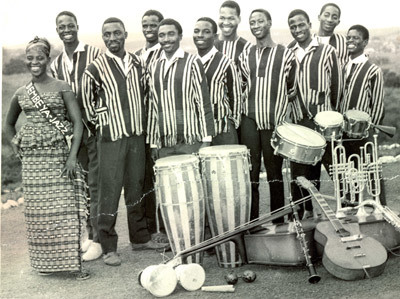 The A-Side featured Bemba Traore and his group. My favorite track from the group, however, was featured on Tempo 7008. The last track on the lp is ‘Kebendo’, a popular dance melody of the Kissi ethnic group. The B-Side of the lp featured the most stripped down of the modern groups that Leo recorded, the Orchestre de Kissidougou. ‘Yanfa’ is described on the record label as a rhythm Donkoura’ and ‘Sekou a l’Onu’ is a bolero that commemorates Sekou Toure’s (the first president of Guinea) visit to the United Nations. For more information on this era of Guinean music and the later developments of the Syliphone era check out Eric Charry’s book ‘Mande Music’. Fantastic. The posts here never cease to amze me. The richness of VOA’ archives is astounding. Keep it up Matthew. Bonne Anniversaire! Happy birthday and wow! So many treasures in just a year! Thank you and please keep on. what a wonderful way to celebrate your birthday – with presents for all of us, and a really great one at that. it’s fascinating hearing the early work by bembeya, to be able to hear how they evolved is really nice. Thank you all for the nice wishes and comments. Zim, Graeme’s work in Conakry with the Syliphone collection and the national radio archives is FANTASTIC. Hopefully he will be able to share, at some point, some of the unknown gems he found. There are so many radio archives throughout Africa that are still intact but just need maintenance help. For example… the archives of Radio Senegal have a large collection of traditional music and hundreds of reels of modern groups in their archives. About ten years ago I was able to visit and looked through their catalog, there were unreleased recordings of most of the groups from the 1970s…Baobab, Star Band etc… and lots of lesser known groups. The archives of Radio Mauritania are the best I’ve seen. They must have over 6, 000 reels. They are all kept in an air conditioned room and seem to be in decent condition. All of their holdings are catalogued, and virtually all of Mauritania’s griots are represented. Radio Djibouti has got a terrific archive of Somali and Afar artists. Other archives seem to have disappeared. Everyone I spoke to in Kinshasa told me that the national radio archives were pillaged during the overthrow of Mobutu. I have also been told that many tapes were destroyed by Radio Mali during the years of military government. Great compilation please dont stop! Hi, This is great stuff and thanks so much for making it available. Tempo 7014 is the only LP I have yet to obtain – would love to hear it! I saw a copy of the Bembeya LP in Conakry but the man refused to sell it. I am working on that! I was very interested to hear of the archives in Senegal and Mauritania. I would like to learn more about them as I will apply for further British Library funding next year. Best wishes, Graeme. 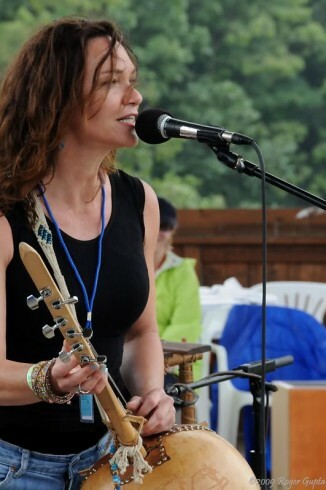 The web site is great, and I loved listening to the music, especially to the more indigenous stuff. It surprises me how early borrowed music was popular, especially that coming from the Caribbean. Guinea is unique because of the support Sekou Toure gave to the arts, especially before he started receiving support from Libya and Saudi Arabia. The web site represents a lot of work and I hope has been brought to the attention of the scholarly community. It’s a shame there are so many modern genres and not more of the traditional ones. There’s also a focus on the Mande ethnic groups, especially (the Mandeng sub-group) e.g., Soso and Malinke, vs. the North and South Atlantic Groups. … but I’m a little prejudiced (see below). Some of the people here might be interested in linking to some of the work I have done. There are some links below. There’s also the incredibly important work of Fred Lamp, now at Yale, on the Baga peoples of Guinea. I think he has been over there recently documenting their music and dance. Especially well known are the masks the Baga use – there’s a video in the Smithsonian if anyone has a chance to go there. and in the interests of completeness, here is the Kim and Bom web sites. These people do not seem to have preserved much in the way of music and dance, probably because there was no Sekou Toure support. Good website. That’s some really beautiful music you’ve posted. Very interesting to read. I own the master tapes used to make the albums but have never seen any of the albums themselves. Very sad to hear the tapes with other music/out takes were destroyed. The Afghan music he recorded is also very well selected.